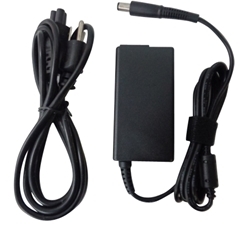 Description: New high quality aftermarket laptop ac adapter charger with power cord 65 watt. Compatible Part #'s: 6TFFF, JNKWD, 3F1CN, HA65NM130, LA65NM130. Dell Inspiron 11z (1110), 13R (N3010), 13Z (5323), 1318, 14 (1440), 14 (1464), 1420, 14R (N4010), 14z (1470), 15 (1525), 15 (1526), 15 (1545), 15 (1564), 1501, 1520, 1521, 1546 ,15R (N5010), 15z (1570), 17 (1750), 17 (1764), 1720, 1721, 17R (N7010), 17R (N7110), 300M, 500M, 510M, 600M, 6000, 630M, 640M, 6400, 700M, 710M, 8500, 8600, 9300, B130, E1405, E1505, E1705, M101Z, M5030, N5030, N5040, N5050. Studio 1457, 1458, 14z (1440), 15 (1535), 15 (1537), 1536, 1555, 1557, 1558, 1569, 1735, 1737. Studio XPS 13 (M1340).